Panoramio is full of amazing photos from the most beautiful places of the world. 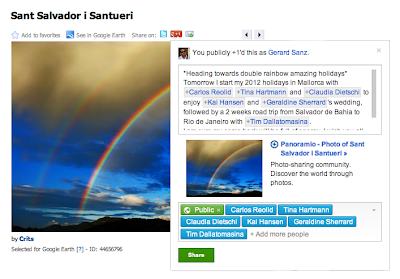 We have added today the +1 button in our Panoramio photo pages. Every time you click on the +1 button in a Panoramio photo you are adding your personal stamp of approval to that photo. You will find your full list of +1’s in a special tab in your public Google profile. You may as well decide to share your thoughts on a Panoramio photo with your friends, your circles or publicly in Google+. The +1 button allows you to do so. Add a comment, select the audience you want to share it with and off you go. We hope you find this addition useful both to expand the audience of your own photos in Panoramio and to share your best findings from the millions of amazing photos from our community.